In the niche-oriented world of major-league jazz, it’s almost unfashionable to be so multi-faceted a player as Han Bennink. Bennink is one of the unfortunately rare musicians whose abilities and interests span the music’s entire spectrum, from Dixieland to free. His straight-ahead playing is absolutely convincing — his time is solid, his sense of swing strong, and his technique flawless. He also possesses the requisite qualities of a free jazz virtuoso; Bennink’s ability to interact quickly and creatively with horn players and pianists is great, as is his ear for timbral contrasts. What ultimately makes Bennink special is his manifest love for the music, a love that inclines him to tear down the cardboard walls that too often separate different schools of jazz. At his best, with colleagues who share his all-encompassing stylistic embrace, Bennink plays the continuum of jazz as an instrument unto itself. Bennink began playing drums while in his teens under the influence of his father, a classical percussionist. He played with hometown musicians in the early ’60s. Between 1962 and 1969, Bennink backed local American jazz greats like Dexter Gordon, Sonny Rollins, and Eric Dolphy on their visits to Holland (he was the drummer on Dolphy’s Last Date album, from 1964). In 1963, he formed a quartet that included pianist Misha Mengelberg, which played the 1966 Newport Jazz Festival. In the mid-’60s, Bennink began to play free jazz with the likes of Mengelberg and Willem Breuker. In 1967, those three founded the Instant Composer’s Pool, a not-for-profit organization designed to promote the Dutch jazz avant-garde. Around that same period, Bennink began continuing associations with the saxophonist Peter Brotzmann, guitarist Derek Bailey, trombonist Alex Schlippenbach, trumpeter Don Cherry, and the Globe Unity Orchestra. 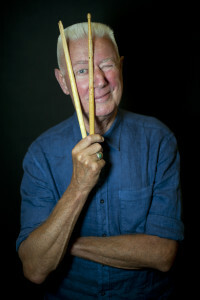 In the ’70s and ’80s, Bennink led and played as sideman on a number of sessions on the FMP, Incus, and Soul Note labels; he made a notable contribution to Steve Lacy’s Herbie Nichols tribute album, Regeneration, with Mengelberg, bassist Kent Carter, and trombonist Roswell Rudd. In the late ’80s, Bennink started, with cellist Ernst Reijseger and saxophonist Michael Moore, the Clusone Trio, which has since become perhaps the percussionist’s most ideal performance vehicle. Both Reijseger and Moore share Bennink’s extraordinarily wide range of musical interests, to say nothing of his absurdist sense of humor. It is, in fact, Bennink’s rather whimsical theatricality that mitigates — for some, at least — the seriousness and depth of his art.